Stumped on how you want your new kitchen to look? You’re not alone. You want to put plenty of thought into remodeling your kitchen and planning out its new design, but this is no easy task. 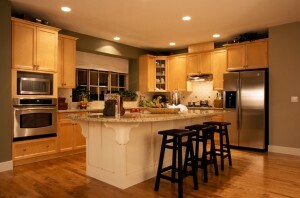 To help get the creative juices flowing, here are a few interesting kitchen designs to consider from HGTV’s website. The work triangle refers to the range, sink, and refrigerator, arguably the three most important work spaces in the kitchen. Arranging these three appliances in a triangular format ensures easy access to all three and easy kitchen workflow. The zone design emphasis space. Using separate workstations for cooking, eating, and cleaning, gives a nice separation for those who like to keep different processes separate from each other. Popular in apartments and living situations where space is limited, the galley is essentially a corridor with kitchen appliances on either side. While it might not promote the most efficient workflow, it does emphasize an efficient use of limited space. The L-shape emphasizes lots of open space in the center of the kitchen by keeping the work area separate from traffic, allowing the two to coexist without interference. The U-shape kitchen takes appliances and counter space and arranges them in a U-shape around a central island, which makes for lots of work space and flexibility in arrangment. This entry was posted on Thursday, November 7th, 2013	at 2:50 pm	. You can follow any responses to this entry through the RSS 2.0	feed. Both comments and pings are currently closed.